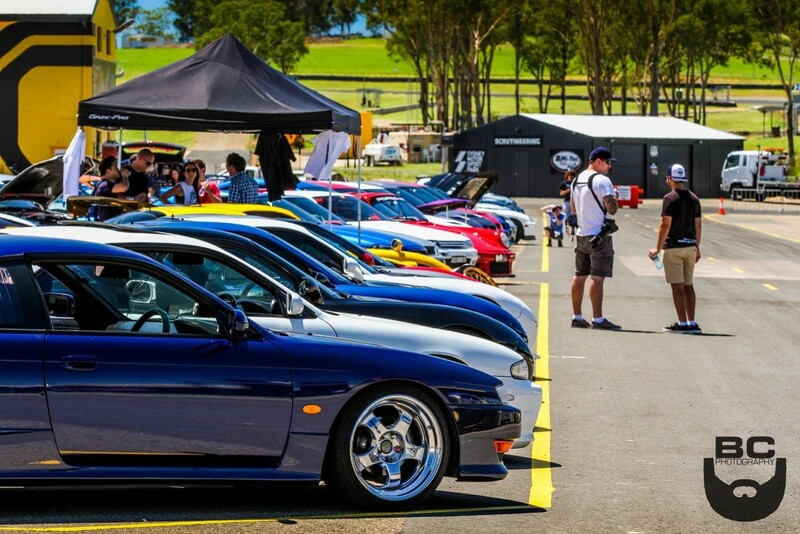 It is that time of year again, the Nulon Nationals kicked off in style with a Motorkhana at Sydney Motorsport Park in January. This was a great way to start the series as it is a low impact day with plenty of fun and heaps of seat time. Round 2 is when the teams start to bring out the big guns, it is held at the famous Bulahdelah Hill climb which claims the fastest public road hill climb in the country. In 2015 it is being held on the 28th and 29th of March and we are kicking it up a notch and opening the doors to the general Motorsport community. Free entry for all spectators, Great viewing areas and over 50 cars lined up ready to roll. First up, we have Todd Herring from the MX-5 club in his Green MX-5. Make no mistake about this car, it is packing all the right gear, from full suspension, brake upgrade, roll cage and a little bit of aero to keep the rear end in tack. What we love the most about this build is what is under the hood. The green machine is packing a Nissan SR20 2.0T motor with mild mods to really get this “hairdressers car” up and moving. For those who have driven the MX-5 chassis before, they will understand how hard this car is going to be to beat on the twisty hillclimb course. For those who haven’t driven one yet, be warned, bring your A game and some sticky tyres… You will need it. Introducing one of the HSV club members Gary Nelson and his bright yellow Corvette. Garry is no stranger to the Nationals events either, in fact he has been to all 3 in 2014. Gary has built this Z06 Corvette to be a very competitive track car including a full built motor, brake and suspension, stripped interior and some aero which makes this big V8 american muscle car a real contender for a top 10 position. Gary had one of the best sounding cars at the hill last year. We cant wait to see it again. Wolf in sheep’s clothing. This is Stephen`s daily driven Honda Civic. This car has had a few form changes in its time, Take the light weight racing wheels and the rear wing off and you wouldn’t pick that this car is one of the fastest N/A Honda`s on Sydney streets. Running a BYP built K24/20 pushing out almost 200klw at the wheels, Steve has also got the steering and brakes sorted. He is a regular at track days all round the country including Phillip island, Winton Raceway and closer to home Wakefield. Steve heads up the Honda team in the Nulon Nationals who are bringing their A game to the hillclimb with 1 goal in mind, come home with nothing less than 1st place. They have submitted their team to us and on paper they have a very good chance of doing just that. Warning shots fired boys and girls. One guy that can upset the plans of the Honda team is Phil Heafey from Evolution Oz. He has plenty of runs on the board at this hillclimb, Winning it twice including in 2014 with an incredible drive. Phil`s Evo is really something special. You can tell alot of time went into the planning of this car. Gearbox is a sequential 6 speed which hooks this little Lancer like a rocket up the Mountain. He is also running a GT Pumps turbo. These turbos are a real piece of work, We fitted the baby brother to one to our company cars and picked up 80klws over standard (fuel system and E85 helped) Phil is coming to the mountain this year with a big target on his back, but we think that he will prove once again that he is the real king of this Hillclimb. Lets hope he can make it 3 in a row. Enter, Cameron Mort. Or Mortune as he is known to his Club Deutsche members, This young gun will show us all how its done in his RS Focus. Producing over 400HP and as some of you may know, these chassis have grip for days so he will have alot of fun on our Hillclimb. Cameron became involved in the Nulon Nationals last year at our Wakefield Time attack and hasn’t missed a round since. Ironically he will miss this years Time Attack event(round 3) as he is off to tick something off his buckets list, “Nurburgring”. That is commitment. He has also run at SMSP, Wakefield, Baskerville, Marulan, Mt Panorama, and Huntley Hillclimb. At just 22, he has done more motorsport events than most of the field. He is a great addition to our event and we thank him for being part of it. The Ford team have really stepped up their game for round 2. The new look team includes Jim and his GT40. This is one of our favourite cars on the road today. Jim has redesigned most of the running gear on this GT40 including front and rear suspension, the whole rear clip on the car was cut out and repositioned in fact, he also hand formed the entire alloy body inside and out. Jim has been a mechanic and fabricator for the best part of 35 years, this build is a true representation of his dedication and passion for cars. If you ever get the chance to see this car in the flesh spend a few minutes looking at the details. 100`s of hand built parts have been turned, molded and fitted by Jim. We sure cant wait to see this beast tackle our hillclimb. Witnessing this car at wakefield, Jim is not scared to throw it around as well. To finish, here is an example of how far these guys are pushing on the hill. It has 4 big sweeping corners on it with some off camber action and it can all go wrong very quickly. For more information on the Nulon Nationals please go to www.facebook.com/nulonnationals – We hope to see you all there on the 28th and 29th of March @ Bulahdelah.